HF3470 Vs HF3471 - What's the Difference? Should I Buy a HF3470 or HF3471? The following is a brief and objective comparison of two Philips Wake-up lights -- the HF3470 and the HF3471 -- contrasting both their similarities and differences within features & specifications across each model. Hence, providing you with a clearer overview as to what each model can offer you & how they will benefit your general 'sleeping' and 'waking-up' routine -- and basically just determining which model will better suits your preferences and needs. 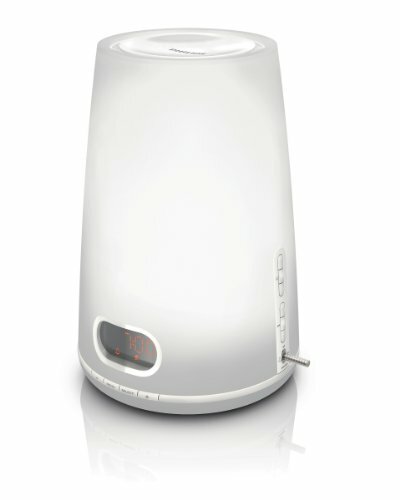 These lamps have been independently clinically proven (as well as being officially recommended by the National Sleep Foundation along with hundreds of users) to offer numerous benefits such as: allowing you to get out of bed more easily and having a generally greater alertness & improved energy levels throughout the day. Moreover, with the HF3471 it also allows you to fall asleep more naturally and quicker (than you would without it, particularly good for people like me who find it rather difficult getting to sleep). Pretty much revolutionizing how we should approach -- the sleeping routine in our lives. As you probably know, it works through replicating the motion of a sun-rise i.e dawn (and with the HF3471 it can also be used before you go to sleep by producing a sun-set i.e dusk) through gradually building (lowering) light intensity, starting with warm reds through to bold yellows, 30 minutes before your set the alarm-noise for (which you can choose to be either the FM radio or natural noises like birds singing etc.). 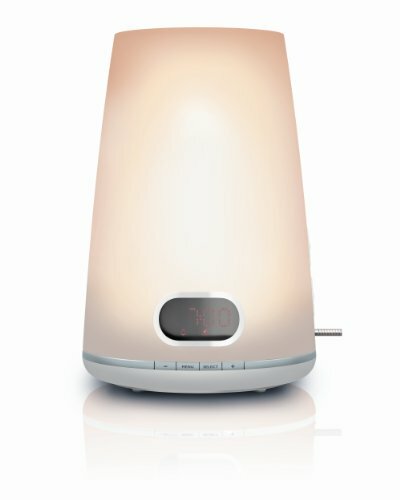 This then allows for both an improvement in sleep quality but also, and more importantly the calming waking up call (and getting to sleep) through gradually awakening rather than putting your body through an almost shock like state with a jarring digital alarm clock which basically 'stresses' your body to wake up. A lot of the features are actually very similar with the HF3470 & HF3471 -- obviously its modern slender, modern looking design being one, with integrated digital clock placed at the front and buttons (to alter wake-up time and other settings etc.) placed around its rim. Furthermore, they both have an integrated FM radio which can be used either casually or as your wake up alarm noise (instead of the nature sounds). Also, through hitting the cleverly placed 'snooze' button you can hit to allow yourself an extra 9 minutes of sleep. With regards to the sun-setting replication they are pretty much identical too -- with the process starting 30 minutes before your set alarm time and alter through a range of 20 different light intensity levels. The main difference comes in the fact that the HF3471 also has the 'dusk-simulation' feature which the HF3470 doesn't, which can act as a lamp for reading and set a calming tone before you go to sleep (this is the specific aspect that allows getting to sleep easier). Moreover, you do get an additional nature sound option -- three in total -- compared to the HF3470 which has two. When bought new they are backed by a twenty four months warranty that will cover both parts and labour costs, if anything were to go wrong. Obviously both lamps have been clinically certified as very safe to use i.e they are UV free etc. The lamps specifically utilised are "Philips Halogen Lamps" at 100W, 12V (code: GY6.35) and are designed & expected to last around twenty years (about 4,000 + hours) so there is certainly no need to be concerned with constantly replacing the lights (as you do with most bedside lamps). Conclusion: Which Wake-up Light Should You Buy? As you can probably gather the HF3471 is just a simple upgrade to the HF3470 and is basically meant for those who just struggle with 'the getting to' sleep (and want that bit more 'edge' in sleep quality) aspect, so if you are fine with that but it is just the difficulty of getting up or still feeling tired when you awaken, you won't be missing out by getting the HF3470 instead of the HF3471. In all, the Wake-Up lights have been very, very cleverly thought out along with the craftsmanship and finish being of the highest quality (I wouldn't even go near a shoddy replica, Philips is the way to go) -- through just reading a few reviews you will soon realise that they offer a tonne of value for their price tag (I mean how you can really put a price on feeling better and having more energy during the day? Certainly, worth around 80-120 bucks, surely?). Do let me know which version you go for and why? Also, if you have any general queries, concerns or questions regarding either the comparison overview of the HF3470 Vs HF3471 or about either model specifically then please do not hesitate to to make them in the comments section that you will find just below and we will be sure to get back to you as soon as possible.